The first Heavy Metal World Knitting Championships have been announced. They'll take place in Joensuu, Finland, on July 11. "Finland is the promised land of heavy metal music," say the organisers. "There are 50 heavy metal bands per 100,000 Finnish citizens, which is astonishingly many and actually more than anywhere else in the whole world. "The number of needlework enthusiasts is equally high, as according to even the most modest estimates there are hundreds of thousands of people in Finland who are immersed various kinds of needlework crafts, knitting included. "What combines them both is the great joy of creativity. When playing guitar as well as knitting stitches it is all about the pleasure of creating something cool with your hands. And – it’s all about the attitude!" To enter the competition, knitters must download the song Fight Or Die by Joensuu thrash metal band Maniac Abductor, then upload a 1 minute video clip of themselves knitting along with the music to YouTube. "April Fools is over so this is happening!," proclaim the band. 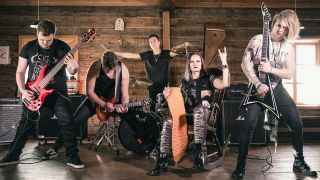 "Our hometown Joensuu will host the World Championships of Heavy Metal Knitting and our song Fight or Die is the official track of the competition." "In heavy metal knitting, needlework and music become united like never before," say the organisers. "On the same stage, accompanied by a million dollar guitar solo, with hair flowing in the air, there’s heavy metal music and knitting, shaking hands. "Knitting to the rhythm of heavy metal music can be compared to playing air guitar – which is a Finnish way to goof around as well. In heavy metal knitting, the knitter becomes a part of the band, showing their best needlework tricks as the heavy riffs echo on the background. "The knitter takes part in the jam while their balls of yarn and knitting needles swish through the air…"
For more information about the World Heavy Metal Knitting Championship, visit the official website. Header image licensed from Joona Kotilainen using the Creative Commons NC (NonCommercial) license.